Covered porches front and rear give this home great country appeal, while an open floor plan plus bonus room (with access from first and second level) make it great for today's family. From the entrance foyer with sloped ceiling and palladian clerestory to the second-level balcony overlooking the great room, fresh details abound. Columns visually separate the great room from the breakfast area and smart, U-shaped kitchen. 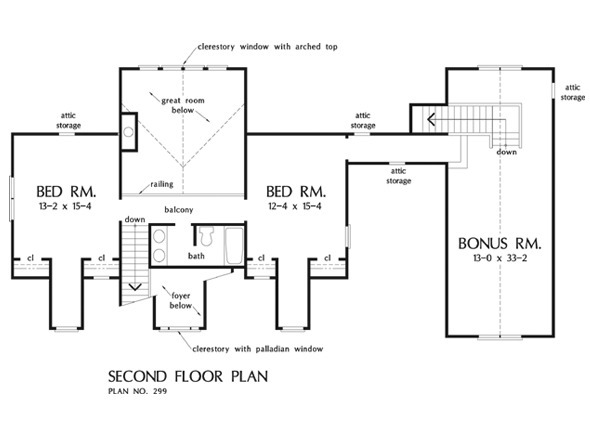 The privately located master suite accesses the porch and features a luxurious bath with separate shower and double bowl vanity. 1st Floor: 1632 Sq. Ft. Bonus Room: 528 Sq. 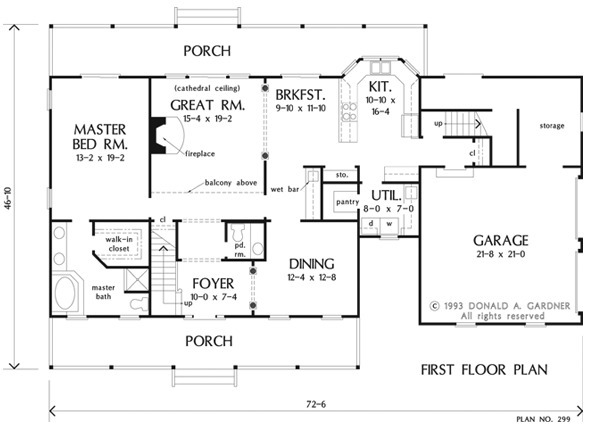 Ft.
House Dimensions: 72' 6" x 46' 10"
Master Bedroom: 13' 2" x 19' 2"
Storage (1st Fl.) 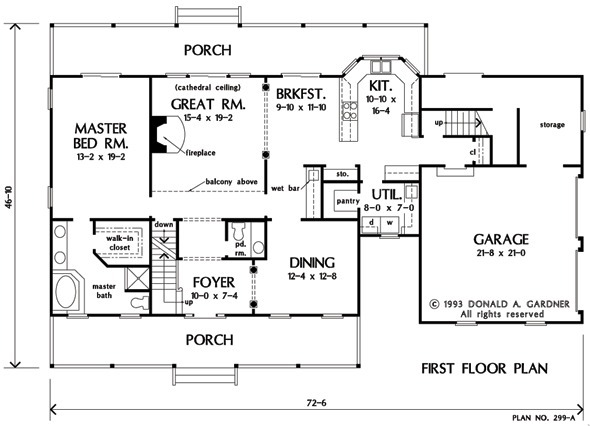 : 2' 0" x 3' 8" x 0' 0"
Foyer (Vaulted): 10' 0" x 7' 4" x 19' 0"
Great Room (Cathedral): 15' 4" x 19' 2" x 21' 6"
Kitchen : 10' 10" x 16' 4" x 8' 0"
Breakfast Room : 9' 10" x 11' 10" x 8' 0"
Utility Room : 8' 0" x 7' 0" x 8' 0"
Bonus Room (Vaulted): 13' 0" x 33' 2" x 9' 0"
Garage Storage : 8' 4" x 11' 6" x 0' 0"
Master Bedroom : 13' 2" x 19' 2" x 8' 0"
Bedroom #2 : 13' 2" x 15' 4" x 8' 0"
Bedroom #3 : 12' 4" x 15' 4" x 8' 0"
Porch - Front : 42' 2" x 7' 0" x 0' 0"
Porch - Rear : 51' 4" x 7' 0" x 0' 0"
Storage (Other) : 9' 6" x 3' 4" x 0' 0"